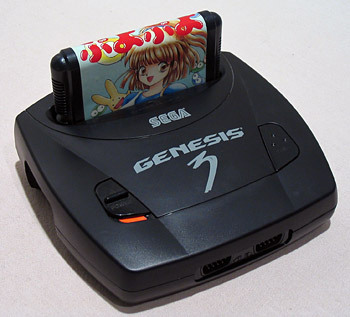 Long after the Genesis was discontinued, Sega signed a deal with Majesco to distribute an updated, stripped-down version of the console designed as a low-cost way to play the many Genesis games still out there. The Genesis 3 was the result, and ironically, it is now the most expensive Genesis model on the used market due to its “rarity” (rarity being a relative term in this case). Yep, it’ll play MegaDrive games; Japanese ones, at least. Sega removed the region check and also the physical locks on the cartridge slot (MegaDrive carts are a slightly different shape, by design), so the Genesis 3 will play MD games natively without modification. (Note: I don’t guarantee this will work with every single game. But it has worked with every game I’ve tried.) I do not know if it will play PAL MegaDrive games, but it will play Japanese NTSC MD games. It has a different controller than the one pictured on the box. Now, this isn’t really that big of a deal, but I know just from looking at pics of various Ebay auctions that Sega (or really, Majesco) did pack in the controller in the box picture with at least some systems. I’m thinking that the one I have is actually an older design, because it cosmetically more closely matches the original Genesis controller (with the “pointy” bottom edge), just with six buttons. So it seems likely that they just threw these in there with the first batch of systems to get rid of them, and then started packing in the newer design. I will say that this is actually a pretty good controller – nice d-pad, snappy buttons – a bit lighter than the original Genesis pad but possibly more comfortable to use. And of course, it’s got six buttons for games that require it, so this is probably the best Genesis controller out there. Anyone know if I’m right about this being the first design of the six-button controller? 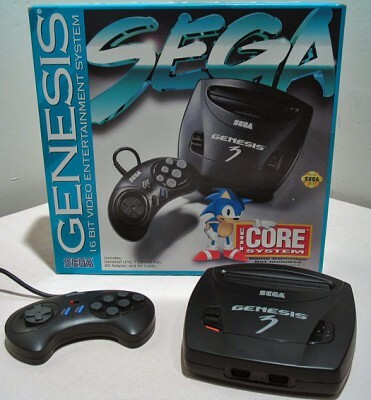 Was this the one Sega sold separately at the time the original Genesis was on the market? That is not the original 6-button controller. Thats a really interesting controller I havent seen anywhere else! Do you have a photo of the back of that controller, or can you tell us the Sega model number that should be molded into the back? I have that same controller! The model number that is molded on the back is identical to the normal 6-button turbo controller. I, too, got that controller with my Gen3. I know it came in the box because I bought it brand new at KB Toys when I was in college. I’m not sure if these odd controllers were with early batches or late batches though, because I got mine seemingly at the end of the life cycle. The console had been marked down to 29.99 and again to 19.99. 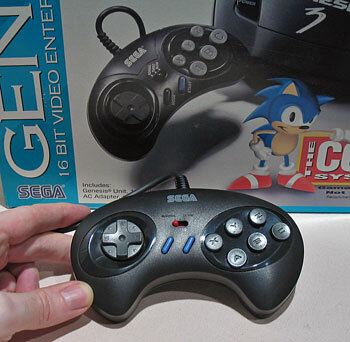 The back of the controller has the Sega logo, “MK-1470”, and “MADE IN CHINA”.